Newly launched ROBIOTIC will be in Booth 279 at the IoT Tech Expo, in Santa Clara, CA – November 28 and 29. ROBIOTIC is much more than a typical IoT design consultancy – we also know how to make your business successful. ROBIOTIC offers complete IoT success for small and medium-sized companies: from sensor selection to business model and everything in between, all the elements necessary for a successful IoT project are part of ROBIOTIC´s portfolio. Working from an entrepreneur's concept, ROBIOTIC is the complete partner for industry 4.0 and IoT business models. Some of these products, like the Smart Call" connected beer coaster that knows how full the beer glass is and makes sure the customer is kept happy, and the Heliscan Plus barcode scanner that captures location info via GPS, will be on display at our booth. "We convert IoT ideas into reality," says Managing Partner Florian Schwingenschloegl. "ROBIOTIC can provide everything an IoT entrepreneur needs, from initial discussions of how the IoT technology-based business idea can be developed and created, to the actual design, development and manufacturing, all the way to cloud intelligence and business implementation – including salesforce integration, marketing, and invoicing." At IoT Tech Expo, attendees are invited to hear ROBIOTIC's Managing Partner Florian Schwingenschloegl speaking about Logistics and Fleet Management as part of the Connected Enterprise track - 11.10 am – 11.50 am, Thursday 29th November. The panel will be discussing Business without Borders – owing to the nature of logistics, a huge consideration of this is having an effective connectivity network to enable this enhanced technology. In addition, the panel will address how eliminate delays in routing and loading, the ever-increasing complexity of supply chain management is turning the pressure up even higher. The panel will provide insights that make big differences, data that can analyze driver behavior, fuel efficiency and predictive maintenance. To make an appointment and for more information please visit us here (https://www.robiotic.biz/en/start) or give us a call at + 1 786-535-9559. 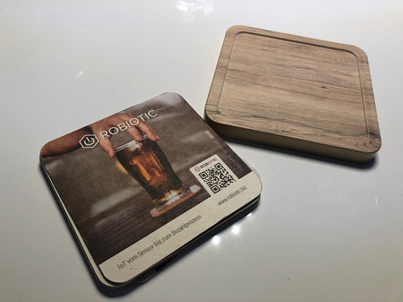 ROBIOTIC is a joint venture of the two companies Hoffmann + Krippner GmbH (https://www.hoffmann-krippner.com/) and TK World AG (https://www.tk-world.de/) and guides traditional manufacturing companies through the 4th industrial revolution. Additionally to the resources of Hoffmann + Krippner and TK World, ROBIOTIC can rely on the expertise of Helicom (http://helicom.de/en/) and Conbee (https://conbee.eu/), also members of the HK Input Systems group, who have already delivered more than 60,000 smart devices to customers.